Image from Carbon Majors project. Actual volume of CO2 emissions attributable to the top 10 investor-owned and state-owned fossil fuel companies, shown in units of 5 billion metric tons. Almost simultaneously that the EPA was announcing its Carbon Reduction Plan, Aaron Selverston contacted us about a piece he was writing for Green Biz highlighting the evolving and vital role of carbon visualisation in supporting environmental priorities at this time. …I am encouraged and inspired by the rise of what I'm calling resiliency catalysts. These are tools that broaden public awareness on climate change and drive implementation of adaptation strategies. At the cutting edge of this movement are powerful climate visualization tools that, on a higher level, show rather than tell the story of our future. 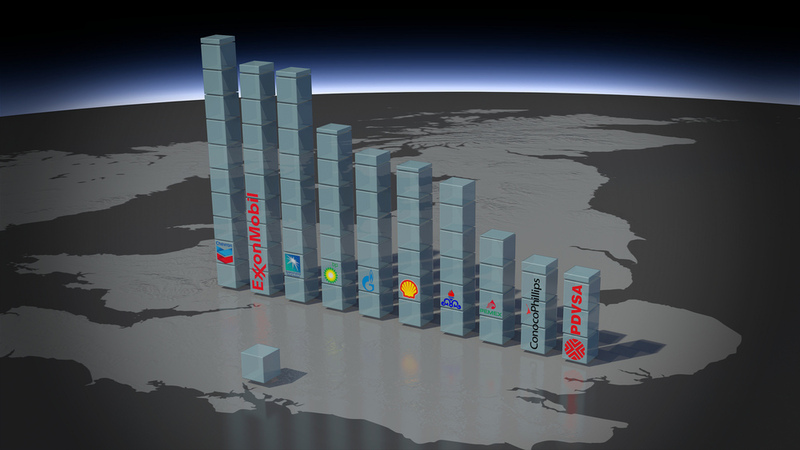 …the pioneering work of firms such as Carbon Visuals, whose broad range of 3D visualizations include the below image, which ranks fossil fuel companies according to the actual volume of CO2emissions for which they are historically responsible. For more about the Carbon Majors project and report, featured in this article.